It’s no coincidence that foods like quinoa and kale have become standard vocabulary in the realm of the present health craze. Calling it a craze, in fact, is somewhat offsetting, as living and eating healthily has become ingrained in North American culture as much more of a lifestyle than a passing fad. Living longer and staying healthy may finally be here to stay as organic and natural continue to become the norm and as opposed to the fringe and unusual. Behind the push towards this newly found health culture movement has no doubt been clever marketing. Marketers have seized the opportunity to promote healthy eating together with nutritional and dietary supplements as the basis for a healthy lifestyle. And as a marketer, it’s important to recognize the triggers that are driving consumers towards a healthier lifestyle so they can become even better at targeting specific demographics when promoting these healthy foods alongside nutritional and dietary supplements. Below are some essentials when it comes to being a savvy marketer in the nutritional supplement market. This is obviously easier said than done, especially with the plethora of new supplements being pushed into the market on a seemingly everyday basis. One surefire way to stand out from the crowd is to use a celebrity endorsement; having a popular chef or notable public figure of the stature of Dr. Oz promoting a supplement product you are marketing can instantly skyrocket that product to the tip of the tongue of anyone who is even vaguely interested in health and nutrition. Celebrity endorsements, however, are few and far between as they are not easy to come by at a reasonable price. The more traditional, but still effective, route is through conducting and publicizing studies stating the benefits of the product and pairing those with real person testimonials. It may take longer, but this method will create organic growth for the product, which may prove better in the long run. You can also use scientists and regular doctors as authorities who can also endorse your products, lending credibility to your product or your product line and putting a name behind it beyond just branding that keeps consumers interested in what you have to say. 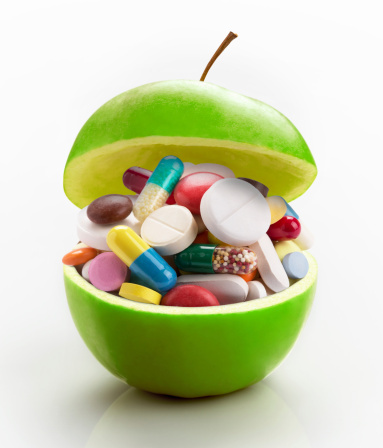 Probably both the most important and most difficult part of selling any nutritional or dietary supplement is education. Informing the public about how the supplement works, its specific benefits, and who should be taking the supplement and why, takes time and a lot of effort. The patience and focus to ensure the right people are hearing the message for the right reason are big parts of success in marketing your dietary aid products. In an age where people now expect information to be both instant and updated, educating the consumer is an ongoing process that should continue throughout the lifespan of the product. This is a point most husbands are already aware of, but in all seriousness, ignoring women when it comes to marketing nutritional or dietary supplements throws into question your entire campaign. Not only are women key influencers, but they are also the ones who are most often up-to-date on all or most dietary and nutritional trends, tweeting, pinning, and talking about everything that’s new and exciting in this market. Women must not only be included in your campaign, but they need to be a priority. Even when targeting supplements for men realize that many times it is the woman in the house who influences or makes the purchase. This is a requirement for marketers looking to target consumers within the supplement market. Mailing lists are highly focused and offer a narrow targeted psychographic that allows you to reach those consumers truly interested in nutritional supplements. While you may feel the whole world should take your product, the profitability from your marketing efforts will be greatly improved by mailing the right lists of the right consumers for your products. Direct mail and e-mail marketing offer an opportunity for results to be clearly tracked. Macromark offers a broad range of dietary and nutritional supplement mailing lists that are available to marketers looking to capitalize on the growing health market.